Starting yesterday, chemical manufacturers, importers, distributors and employers are required to provide a common approach to classifying chemicals and communicating hazard information on labels and safety data sheets. Chemical manufacturers and importers must provide a label that includes a signal word, pictogram, hazard statement, and precautionary statement for each hazard class and category. Beginning in December, distributors may only ship containers labeled by the chemical manufacturer or importer if the labels meet these requirements. The new format for Safety Data Sheets requires 16 specific sections to ensure consistency in presentation of important protection information. For more information, see OSHA's Hazard Communication webpage. Secretary of Labor Thomas E. Perez (left) watches as President Barack Obama signs the Fair Pay and Safe Workplace executive order on July 31, 2014. While the vast majority of federal contractors play by the rules, every year tens of thousands of American workers are denied overtime wages, are unlawfully discriminated against in hiring or pay, have their health and safety put at risk by those contractors that cut corners or are otherwise unlawfully denied basic workplace protections. That is why on July 31, 2014, President Obama signed the Fair Pay and Safe Workplaces Executive Order, which will require prospective federal contractors to disclose labor law violations and give agencies more guidance on how to consider labor violations when awarding federal contracts. On May 27, the Department of Labor issued proposed guidance to assist contracting agencies and the contracting community in applying the order's requirements, including evaluating the severity of labor violations. The Federal Acquisition Regulatory Council is also issuing proposed regulations integrating the order's requirements, and the provisions of the Labor Department's guidance into the existing procurement rules. Both the FAR Council's proposed regulations and the Labor Department's proposed guidance will be published in the Federal Register, followed by a 60 day public comment period. OSHA has published a proposed rulemaking to approve a new occupational safety and health plan for Maine state and local employees. Under the OSH Act, state and local government employees are specifically excluded from federal coverage. These employees receive formal OSHA coverage only through an OSHA-approved State Plan, which must be at least as effective as the federal program. The Maine State Plan for state and local government employees will be the newest OSHA-approved State Plan. If approved, the plan will cover approximately 81,000 public workers. Private sector and federally employed workers will remain under the jurisdiction of federal OSHA. Comments and requests for a hearing must be submitted by June 19, 2015. Comments may be submitted electronically at www.regulations.gov, the Federal eRulemaking Portal, by mail or facsimile. For more information, see the Federal Register notice. OSHA inspectors have again cited a Dollar General store for ignoring the dangers of blocked emergency exits. A recent inspection of the store in Bear, Del., resulted in other violations including electrical panel and fire extinguisher hazards. The company received proposed penalties of $122,100. "Again and again, our inspectors have found similar hazards at Dollar General stores, yet the company continues to put its employees at risk," said Erin Patterson, director of OSHA's Wilmington Area Office. "In a fire or emergency, every second counts. A blocked exit route can lead to tragedy. The company needs to address these serious issues immediately." These violations continue a six-year history of similar safety hazards found in more than 70 inspections of Dollar General Corp.'s stores nationwide. The company has received more than 40 citations since 2009. For more information, read the news release. Nine contractors at a newly constructed residential development in Doral, Fla., chose to ignore worker safety and expose their employees to dangerous falls and other serious safety risks. OSHA inspectors found a number of serious and repeated violations, fining the contractors a total of $152,200. "Shoma Alliance Management Corp. and its contractors exposed their employees to numerous safety hazards or permitted multiple risks, including falls that could have resulted in death or serious injury," said Condell Eastmond, director of OSHA's Fort Lauderdale Area Office. "Developers and general contractors are responsible for the safety of employees at their work sites. OSHA will continue to hold them accountable for the employees' safety." Shoma is the residential construction developer of the luxury housing development. The company received three serious citations for exposing workers to fall hazards, improperly using a ladder and failing to provide ladder safety training. The eight other contractors were cited for violations including lack of fall protection, failing to develop a hazard communication program for employees working with silica dust, failing to install handrails and not ensuring the scaffolding system was fully planked. For the list of contractors cited, citations issued and additional information, read the news release. An assembly technician for a battery charger manufacturer was electrocuted while testing transformers. The 31-year-old had only worked for Ferro Magnetics Corp. for one month. An OSHA investigation found the Bridgeton, Mo., company failed to supply adequate personal protective equipment, provide training and follow safety procedures. Proposed penalties total $106,400. "In seconds, a family was altered forever, and a young girl is now fatherless," said Bill McDonald, OSHA's area director in St. Louis. "Companies that operate with high-voltage electricity must train workers to recognize hazards and use proper procedures to prevent electrical shock. No one should die on the job. Ferro Magnetics must act now to train its workers, so that another family does not suffer." The company was cited for one willful and 14 serious safety violations including electrical safety hazards, lack of safety guards on machines with moving parts, inadequate protections to stop machines from starting during service and maintenance, and improper storage of hazardous chemicals. For more information and to view the citations, see the news release. A foundry in Kansas City, Mo., its owner and three members of its safety consultant company have been found in criminal contempt by a U.S. District Judge. The action came after the parties resisted and disobeyed a court order to allow federal inspectors to investigate a report of an employee with an elevated level of lead in his blood at the foundry. Martin Foundry Co. Inc. owner Darrell Stone and representatives of Compliance Professionals Inc., all based in Kansas City, admitted they resisted and disobeyed an administrative search warrant on April 6 to cooperate with an OSHA inspection. At that time, Stone and representatives from Compliance Professionals refused entry in violation of the warrant, which OSHA had obtained because Stone denied inspectors entry into the foundry during their initial visit on March 27. OSHA initiated the inspection after the Missouri Department of Health reported that an employee had an elevated blood lead level. Exposure to high levels of lead may cause anemia, weakness, and kidney and brain damage. Each year more than 50,000 American workers die from occupational exposure to lead, asbestos and other substances. The U.S. District Court in Kansas City has ordered the defendants to jointly pay $10,778 to reimburse departmental costs. Martin Foundry and Stone are also each liable for $1,000 in fines for their failure to cooperate. The three third-party consultants will each pay fines of $2,000, based on a finding that they willfully impeded OSHA's investigation and refused to comply with the warrant. For more information, see the news release. OSHA has updated its Whistleblower Investigations Manual to increase uniformity and predictability in the settlement and damages aspects of whistleblower cases - a significant benefit for both employers and workers, and their attorneys. Revisions to Chapter 6 in the manual, "Remedies and Settlement Agreements," lay out OSHA's guidelines for ordering compensatory and punitive damages, including the factors that OSHA uses for calculating these damages. The chapter affirms that OSHA may award compound interest for out-of-pocket damages, such as credit card interest, annuity losses, and job search expenses incurred by a worker as the result of unlawful retaliation by an employer. The revised chapter also clarifies the method OSHA follows to award attorneys' fees under appropriate statutes. OSHA enforces the whistleblower protection provisions of the OSH Act and 21 other statutes protecting workers who report violations of laws in various industries. In fiscal year 2014, OSHA helped award more than $35 million to whistleblowers across the country ― sending a powerful reminder to employers that workers have a right to speak up, without fear of retaliation, when they believe that their safety and health is at risk – including the right to complain to OSHA. The revisions to OSHA's manual clarify how violating workers' rights can have serious consequences. The Department of Labor’s Wage and Hour Division and OSHA are working together to educate nail salon workers about their rights to a safe workplace and fair pay. Two new publications – a Nail Salon Worker Rights flyer and wallet card – explain basic workplace rights, highlight chemical hazards and their health effects, and list practices to protect worker health. The new materials also include information on a worker's right to be paid full and fair wages for all hours worked, including minimum wage and deductions, overtime pay, and recordkeeping of all wages. The publications are available online now in English, Korean, Vietnamese, Thai and Spanish (and will soon be available in Chinese and Nepali). To learn more about nail salon safety, see OSHA's Guide for Nail Salon Workers and visit OSHA's Heath Hazards in Nail Salons webpage. OSHA has released a new fact sheet on hazards from food slicers and meat grinders used in grocery stores, restaurants and delis. These machines can cause serious cuts and amputations when workers are using, maintaining or cleaning them. In 2013, at least 4,000 incidents involving meat slicers occurred that resulted in lost workdays. 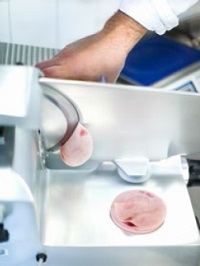 The fact sheet provides employers with the requirements on how to prevent cuts and amputations from working with food slicers and meat grinders. OSHA developed this fact sheet based on information gathered through the agency's new reporting requirements that employers must notify OSHA of any work-related in-patient hospitalizations, amputations or loss of an eye within 24 hours. A new publication by OSHA provides guidance to employers on best practices regarding restroom access for transgender workers. OSHA requires that all employers under its jurisdiction provide employees with sanitary and available toilet facilities, so that employees will not suffer the adverse health effects that can result if toilets are not available when employees need them. The core principle of the guidance is that all employees, including transgender employees, should have access to restrooms that correspond to their gender identity. OSHA's goal is to assure that employers provide a safe and health working environment for all employees. The best practices guide was developed through OSHA's alliance with the National Center for Transgender Equality to provide NCTE affiliates and others with information and resources to help foster safer and more healthful American workplaces. For more information, see the news release. OSHA has updated the Hazard Identification Safety Tool, an interactive training tool to help small businesses identify hazards in the workplace. The revised tool adds a new healthcare scenario and two new visual inspections. Additionally, the tool is now compatible with PCs and Macs. Another update is in the tool's OSHA Visual Inspection Training building, where users can conduct an interactive inspection of a housekeeping cart and patient lift, and watch workers perform job tasks. For more information, watch the trailer. This is why the Occupational Safety and Health Administration and National Oceanic and Atmospheric Administration are joining forces to promote a Summer Safety Campaign. OSHA provides resources for workplace preparedness and response to severe weather emergencies that can arise during summer, including: hurricanes, wildfires and floods as well as severe heat. OSHA and NOAA encourage employers to be aware of weather forecasts, train workers on severe weather plans and keep emergency supplies, including a battery-operated weather radio. Some parts of the country have already experienced deadly and damaging flooding this season. And hurricane season begins today in the Atlantic and began in mid-May in the Pacific. Both high-hazard seasons run through November. Employers and workers need to be prepared with a detailed plan before these events occur to ensure that everyone stays safe. And with temperatures rising, now is the best time for employers to prepare to protect workers outdoors. Workers in outdoor industries like agriculture, construction and transportation face serious hazards from working in the heat, including illness and death. One handy tool available for free to prevent these hazards is the OSHA Heat App that calculates the heat index (both temperature and humidity) at your worksite and provides recommendations for how best to protect workers based on the risk level. OSHA's heat app, recently updated for iPhone users, has been downloaded more than 193,000 times. Dr. David Michaels (left), assistant secretary of labor for occupational safety and health, and Charles Ayers, CCAR president, at the Alliance renewal ceremony on May 12, 2015. OSHA has renewed its alliance with the Coordinating Committee for Automotive Repair to provide training and resources to help protect workers in the car repair industry, as well as information on workers' rights and employer responsibilities under the OSH Act. Through the alliance, OSHA and CCAR will develop training for automotive lift safety, handling absorbed glass mat batteries, and working with automotive air conditioning refrigerant. This agreement will remain in effect for five years. For more information, visit the CCAR Alliance page. Through its Alliance Program, OSHA works with unions, consulates, trade and professional organizations, faith- and community-based organizations, businesses and educational institutions to prevent workplace fatalities, injuries and illnesses. The purpose of each alliance is to develop compliance assistance tools and resources and to educate workers and employers about their rights and responsibilities. Alliance Program participants do not receive exemptions from OSHA inspections. Assistant Secretary of Labor for Occupational Safety and Health Dr. David Michaels presents OSHA's Voluntary Protection Programs Star site flag to Captain Rich Blank, commanding officer of the Naval Surface Warfare Center Carderock Division. NSWC Carderock earned its VPP Star site designation by being an exemplary worksite with a comprehensive, successful safety and health management system. OSHA has formed an alliance with the Associated Builders and Contractors of Greater Houston, American Subcontractors Associations-Houston Chapter, Gulf Coast Safety Institute of the College of the Mainland and the Scaffold and Access Industry Association to protect workers from fall hazards in the construction industries. For more information, see the news release and read about OSHA's efforts to protect construction workers. Secretary of Labor Thomas E. Perez recently renewed the charter of the Maritime Advisory Committee for Occupational Safety and Health. The Department of Labor established MACOSH in 1995 to advise the secretary of labor on various issues related to safe and healthful working conditions in the maritime industry, including standards, injury and illness prevention, training and outreach initiatives, and enforcement initiatives. Since receiving its first charter in 1995, MACOSH has made more than 100 recommendations to OSHA. The agency used these recommendations to develop guidance products and standards. MACOSH meetings are open to the public. For more information, see the Federal Register notice. A new blog post from the National Institute for Occupational Safety and Health outlines concerns that a revised nail gun standard from the American National Standards Institute does not reflect current scientific evidence, and is not protective enough of workers. Pneumatic nail guns injured about 22,000 workers each year from 2001-2005 severely enough that they needed treatment at an emergency room. About 14,800 consumers also had similar injuries from nail guns during the same time. The revised standard makes minor improvements to the previous version, such as explaining the different nail gun trigger systems. However, NIOSH encourages everyone to rely on its publications for the most protective recommendations on nail gun safety. These publications include a booklet jointly produced by OSHA and NIOSH that is available in English and Spanish. For more information, see OSHA’s Nail Gun Safety webpage.